You write compelling content which you believe can go viral. Your articles are full of value for the reader, including illustrative examples and useful tips. What could go wrong? We know this harsh truth about content marketing: it doesn’t matter how brilliant your article is if no one can find it on the Internet. Unfortunately, great content is no longer enough to be a successful blogger. There are a bunch of technical steps which determine your success: from optimization for Google search to social media promotion. So if you don’t want to see your article taking a back seat, you should play by the rules of this SEO game. Let’s find out what you can do if your great article somehow isn’t getting traffic. It’s no secret that SEO is a long-term process. Link building, creating content, finding appropriate keywords aren’t meant to bring a quick result. Refreshing old content is probably the fastest SEO effort you can implement, as well as any effort which aimed at improving existing situation instead of creating something new. You have a lot of articles on your blog, and some of them are less popular than others. At the same time, you believe that your unsuccessful articles deserve better than this. There is a big chance that your article isn’t bad, you just forgot to take account of some SEO factors. You had some articles with good results, but the traffic is getting lower gradually. Obviously, you want to extend and increase its popularity. None of your posts are getting much traffic. If this is the case, make sure to read a comprehensive SEO guide (my personal favorite is Moz’s beginner’s guide). Only after you have read that, get back to this post. I’m writing it for people who want to find gaps in their sites’ optimization, not to make it from scratch. Open your Google analytics and find articles which you believe are great but for some reason aren’t getting as much traffic as they could bring. Make a list of such posts. Now take a deep breath, and let’s do some magic! Remove all irrelevant information and replace it with fresh data. For instance, you can find new experiments/studies to prove your point and add more value to the post. Make sure the screenshots (and other media files) that you used are still relevant. If the interface of the tools you show in the post look differently now, it will be confusing for the reader. I think you got the point: you should make your content relevant and interesting to the reader again. Well, either way, your content will be more visible after improving the various SEO aspects. But is it worth the effort if no one wants to read your outdated article? Now let’s find out if there is something we can improve in the meta-tags. I use the SEO meta in 1 click plugin to handle this issue. 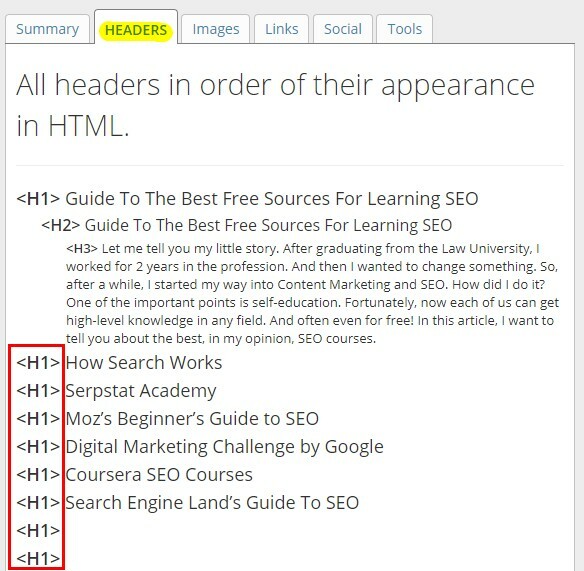 It shows all meta-tags and headings on the page, so you can make sure that you didn’t forget to add it. If it’s absent — add it relying on Google’s recommendations. Every page needs a Title and Description. Each of the above should include your primary keyword. (And each should be as close as possible to the beginning of the phrase). The description should be from 50 to 160 symbols (about 15 words). The title — less than 12 words. The page should have an H1 tag, and it should be a little different from the title. They should be in the right order. There should be only one H1 on the page. As you see, the random page I’ve checked isn’t good enough. Both Title and Description are present on the page, but there is a problem with the length. Google bots don’t understand what your content is about. 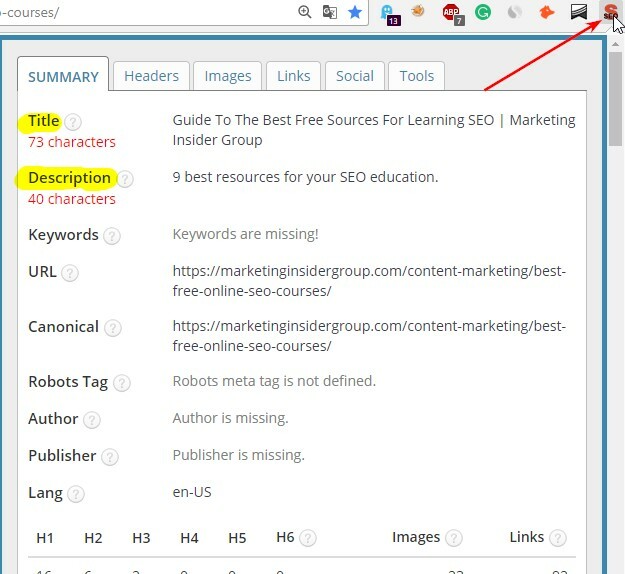 The meta-tags help them to find out if your page is relevant to a user’s query. Be kind enough to help Google bots with it, and it will pay off with higher rankings. Another thing that can help search engines to figure out the topic and aim of your article is keywords. They are meant to help search bots find out what reader’s problem we want to solve in the article. Pay attention to the position in the SERP by this keyword and the keyword’s volume at Google. In our case, the most frequent keyword within this issue is “learn seo free”, and our article takes 7th position. If you see that your article is far from the top-10, it means that there is a lot of work to do! First of all, your article needs to target far more keywords, including long-tail ones. Moreover, not every keyword will fit your purpose. Since we want to get in the top-10, we need mix up high-frequency keywords with the middle and low ones. You can use any tool with keyword difficulty features like Serpstat, Semrush or SEOquake. This metric shows how difficult it would be to rank high for the desired keyword. I’ll go with SEMrush this time. The competition is significant, to say the least! Now you should check competitors’ content to decide if the possible rewards are worth the efforts. Sometimes, competitors are so strong that you may possibly spend more than you can reasonable expect to earn. Let’s see how things are with the positions and keywords in competitors’ similar articles. To do this, click on the “Competitors” at Serpstat and select the top-3 for analysis. In our case, a lot of this links are actual SEO courses, so they’re not our competitors. I haven’t found useful and fresh content among this list so we definitely could give it a try. At this stage, analyze not SEO aspect alone. Find articles on the similar topic and pay attention to article structure, writing style, value for the reader, length, examples, media files, etc. Since our aim is to make this post rank higher, we should be sure to create something 10x better compared to competitors. Here you can find articles on similar topics and influencers who are interested in your subject as well. Small tip: mention some bloggers (or their articles/studies/investigations/quotes) within an article, and then send it to them just to ask the opinion. If the content is good, there is a significant chance that the blogger will share it to his or her own channels. Here is the best guide to blogger outreach I know. Make sure to take a look at this post as I believe it can save you from most common mistakes. What’s next? Wait for the reaction of the search engine and monitor the positions after re-optimization. Remember: there is no such thing as “100% SEO optimization”. There is always room for improvement! To find such opportunities, analyze the competitors from time to time. Remember to perform basic SEO optimization on your articles, and always refine the texts. Try it for yourself and draw your own conclusions! Would You Like To Add Some Tips? What do you do to re-purpose your old articles? Do you have any other SEO tips that you’d like share? If so, please comment, below. Anna Rud is a Content Marketer in an IT company. She's often writing useful pieces on how to rank higher, how to write for the Web, how to carry out PPC campaign and so on. Obsessed with the constant learning.